Groovanesia are - Cha: Vocal, Guitar, Keys. Pras: Drum and Percussion. The Band has more than 30 original songs and never been recorded commercially. Heavily influenced by the music of their Indonesian homeland plus other upbeat groovy music genres such as Ska, RnB, Jazz and Reggae, Groovanesia perform their own unique style. Tropical vibe. 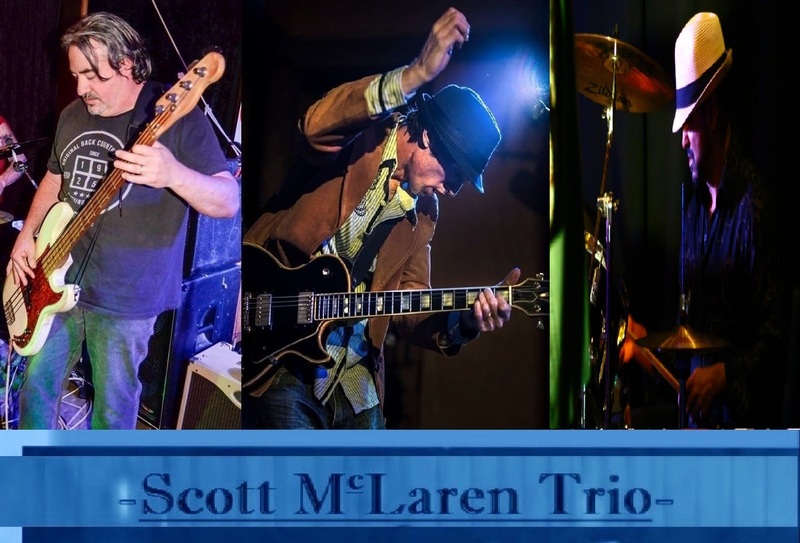 Scott McLaren Trio are a professional and experienced Classic Rock, Rock and Roll, Blues & Roots Soul trio from the Central Coast. Playing some original material but mainly covers from such artists as - The Jimi Hendrix Experience - Stevie Ray Vaughan & Double Trouble - Cream - Santana - Led Zeppelin - The Beatles - The Doors - JJ Cale - Pink Floyd - T REX and many more. also featuring the musical talents of rock steady bassist Craig Thomlinson (Stonefish - N.F.I.) & funk master drummer extraordinaire Mick Layman (Brass Monkey - Remedy). SMT are a hot mixture of Classic Rock/Rock and Roll with a cool blend of Funky Blues & Jazzy Soul flavours guaranteed to get you up and dancing the night away. So last time we spoke, we were on the rebound after a narrow defeat at the Girrakool Band Comp. Well that was then and this is now, so its time for us to get back on the proverbial and have a crack, so we invite you to join us at Brackets and Jam on Friday 26 October for some bangin’ original music. Now that we have slightly more idea of what we’re doing (big call I know) and with our repertoire of originals developing, we have decided to kick start the summer by moving on from NFI to adopt our former name of Stonefish. Its where it all started with Andy and I along with Craig, our bass player. We figured that if Andy had never ventured back to England in 2011 we would never have changed the name, and many peeps still recall the days of fun gigs with Stonefish so it was a no brainer for us. We also have great pleasure in to introding our new drummer, Col Booth, who has recently joined us and been getting up to speed so we can gig again. Col is another Central Coast local who has been playing in both covers and originals bands since the late 70’s (sounds like a long time ago but he started young!). Col began his drumming career in a band with Matt Moffat, the super talented founder, singer and songwriter of the legendary Sydney 80’s band Matt Finish. If that’s not enough, we will be videoing the Brackets and Jam gig for use in upcoming clips for the band so a bit of punter participation would be appreciated. While it’s a little late notice, we would love to see as many people there as possible to keep the Brackets & Jam vibe alive. We are really looking forward to playing live again and will be amped for this one, see ya there!